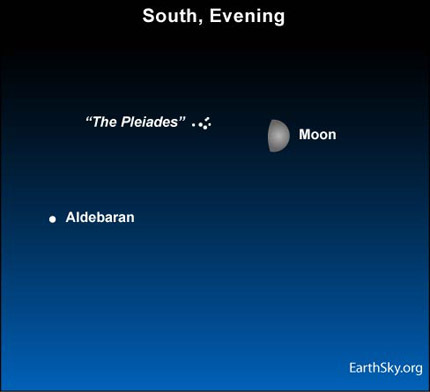 The waxing gibbous moon and the Pleiades star cluster are found high in the southern sky at early evening. Although the moonlit glare may make it difficult to see this tiny, dipper-shape cluster of starlets tonight, be sure to check out the Pleiades on a dark, moonless night. The moon will leave the evening sky during the last week of January 2011, staging the Pleiades in a dark starry sky. Then, you can use Orion’s Belt to find the sky’s most famous star cluster, as we show on tomorrow’s chart. As evening deepens into late night, the Pleiades follow the moon westward across the sky. They set in tandem beneath the west-northwest horizon in the wee hours after midnight. The farther north you live, the later they set. The farther south you live, the earlier. At mid-northern latitudes in North America, the moon and Pleaides sink below the horizon tomorrow around 3 a.m. local time. Despite the moonlit glare, you can still use binoculars to gaze at the Pleiades to the east (or left) of the moon tonight. This cluster is also called the Seven Sisters, even though most people can only see six Pleiades’ stars with the unaided eye. Stories about the Lost Pleiad abound in sky lore. Previous Story: Can Berthoud bring back the Quilt Show? Site contents copyright © 2019 Recorder Online	except as noted. All rights reserved. | 88 queries in 2.224 seconds.